Press the ‘Freeze’ button to save the current view and then any changes will create a new graph above. This is particularly useful when you want to compare things across years etc. There is a large number of different data formats that can be viewed in this mode. 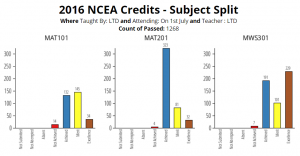 The numbers in this graph represent the number of students who have gained the specified number of credits in each course. The numbers in this graph represent the number of students who have gained at least the required number of credits at the specified level or higher. This number can be set individually for each course using the coursedepartment.csv file. It is highly recommended that you filter the data by year level before selecting this view. This graph is very similar to the last, except it chooses to display Level 1 for Year 11, Level 2 for Year 12 and Level 3 for Year 13 students. 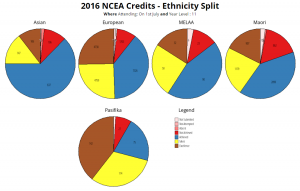 The numbers in this graph show the number of credits passed in the levels indicated by the title. This is to easily allow you to show Year 11s Level 1, 2 and 3 credits as all credits count towards Level 1 and similar for Year 12 students sitting Level 2 you want to display Level 2 and 3 credits. 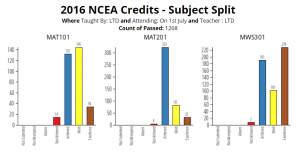 The numbers in this graph represent the number of assessments that students have passed at the specified level. This shows a graduated colour scale of students who have the 3 different attendance levels. Note: you can filter these by department as well if you want to look at progression in just one department. This table shows the percentile of the student based on the GPA for Year 11, 12 and 13 (weighting of 4 points for each Excellence Credit, 3 for each Merit, 2 for each Achieved and 0 for each Not Achieved)… 100% is the top student, 0% is the bottom student. This compares students to just the students in their own cohort (eg: all the students who were Year 11 in 2016 are compared to the other Year 11s in 2016, but not the Year 11s from other years). This makes it an objective position of the student relative to their peers over time. This view allows you to build a custom table with any extra student info or assessment results. To add in the assessment info you must type in part of the standard / assessment number or title. This selects what year you want to display the data for. There are a number of different ways to present data in assay3. Half Year (various): splits by the months shown. Student Type: splits by students’ type… eg: RE, FF etc.